[Do] not some of us feel that the world grows more attractive to us as we grow older? It should not be so; but so it is. This comes of lukewarmness. Age unlearns many things; but woe betide it when it unlearns vigor, when it unlearns hope! Rest is a great thing. It is the grand want of age. But we must not lie down before our time! Ah! how often has fervent youth made the world its bed in middle life! and when at last the world slipped from under it, whither did it fall? If we live only in the enervating ring of domestic love, much more in the vortex of the world,we must live with Jesus in the spirit of Mary or we are lost. 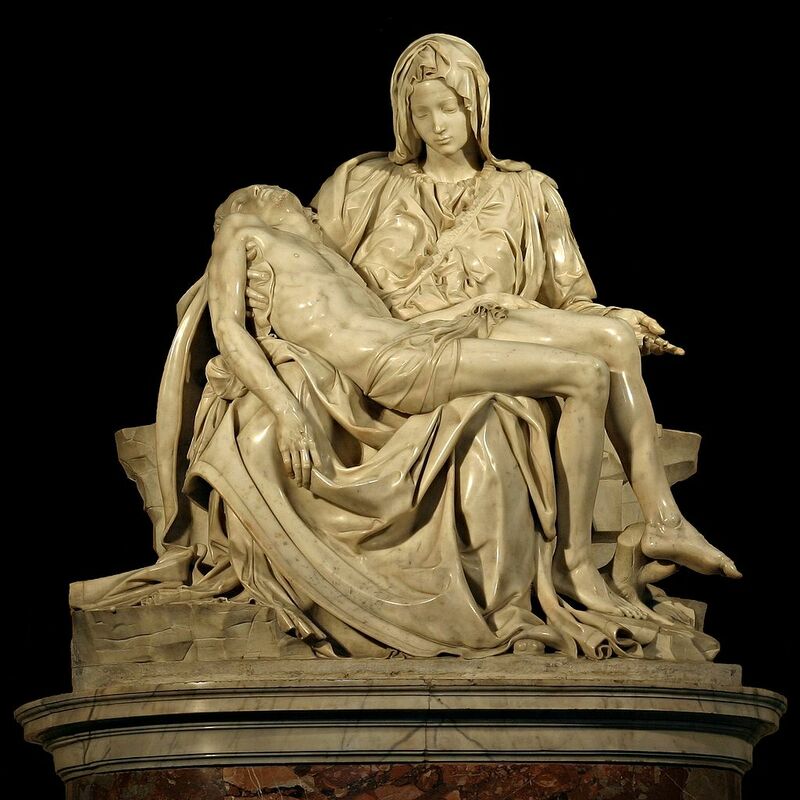 Image: Michelangelo’s Pieta with black cut out by Stanislav Traykov, Niabot (cut out) Permission is granted to copy, distribute and/or modify this document under the terms of the GNU Free Documentation License, Version 1.2 or any later version published by the Free Software Foundation; with no Invariant Sections, no Front-Cover Texts, and no Back-Cover Texts. A copy of the license is included in the section entitled GNU Free Documentation License. This file is licensed under the Creative Commons Attribution-Share Alike 3.0 Unported license. At Wikipedia and incorporated here by reference. P.S. The Seven Sorrows of Mary are: 1) The Prophecy of Simeon; 2) The Flight into Egypt; 3) The Three Days’ Loss: 4) Mary meets her son with the cross; 5) The Crucifixion (Mary at the foot of the cross); 6) Jesus is taken down from the cross; and 7) The burial of Jesus. The devotional booklet I use and recommend is: Devotion to the Sorrowful Mother (TAN Books).